Never run the engine in a closed or poorly ventilated area any longer than is needed to move your car in or out of the area. The carbon monoxide gas emitted is odorless and can cause serious injury or death. 1. Insert key, and fasten the seat belt. 2. Depress the clutch pedal fully and place the gearshift lever (manual transaxle) in neutral or the selector lever (automatic transaxle) in "P" (park) position. 3. After turning the ignition key to the "ON" position, make certain all warning lights and gauges are functioning properly before starting the engine. Be sure that the clutch is fully depressed when starting a manual transaxle vehicle. Your manual transaxle equipped vehicle will not start unless the clutch pedal is fully depressed. On a manual transaxle equipped vehicle that can be started without depressing the clutch, there is the potential to cause damage to the vehicle or injury to someone inside or outside the vehicle as a result of the forward or backward movement of the vehicle that will occur if the clutch is not depressed when the vehicle is started. 4. 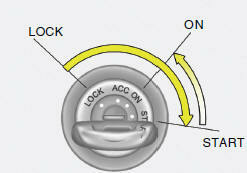 Turn the ignition key to the "Start" position and release it when the engine starts. After the engine has started, allow the engine to run for 10 to 20 seconds prior to placing the vehicle in gear. The starter should not be operated for more than 15 seconds at a time. Wait 15-30 seconds between starting attempts to protect the starter from overheating. Always fully depress the brake pedal before and while shifting out of the "P" Park position into another position to avoid inadvertent motion of the vehicle which could injure persons in or around the car.